ATEME - which supplies video encoders and decoders to the satellite newsgathering industry - has seen sales rise rapidly this year. Benoit Fouchard, Chief Strategy Officer, said, "This part of our business is growing very fast. This year we've had just over a 50% increase in sales and there is room for further significant growth." Based just outside Paris, ATEME saw its fortunes improve significantly after taking the decision five years ago to focus solely on supplying its products to the broadcast industry. 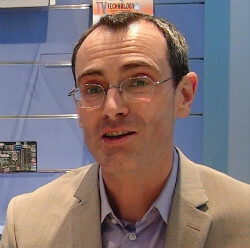 Benoit said, "We used to serve different types of codec applications including video conferencing and the consumer market but since 2007 we have been focused only on the broadcast environment and that has allowed us to become much more intimate with a small number of applications such as video-on-demand and contribution backhauling through satellite. By understanding these applications much better, we've been able to design products that are much more fit-for-purpose." The company has come a long way from when it was launched in 1991. In those days it was involved in designing complex video processing equipment including the system that transmitted the first video of the sunken Titanic lying on the seabed. "By the end of the 1990s we started getting the first semi-conductors that were programmable and powerful enough to host a video compression algorithm," said Benoit. "That's when we had the possibility of designing our own codec technology." "Today, the main differential of ATEME is its proprietary compression technology. We have a large group of researchers who are essentially mathematicians who come up with original, more competitive and higher quality compression algorithms." Benoit says the company is now regarded as one of the top three players in the SNG codec business. "We've been able to break in to this industry thanks to our innovative codec technology," said Benoit. "For example, we were the first to bring 10-bit compression to the market. But, going forward, we will focus on the user-friendliness of our products. Our future success depends on paying attention to detail and making products that are easy and efficient to use for truck operators."